Odile (Sabine Az�ma) is looking for a new, bigger appartment. Her younger sister Camille (Agn�s Jaoui) just completed her doctoral thesis has fallen in love with an estate agent who is responsible for Odile's apartment and who has an elder employee. 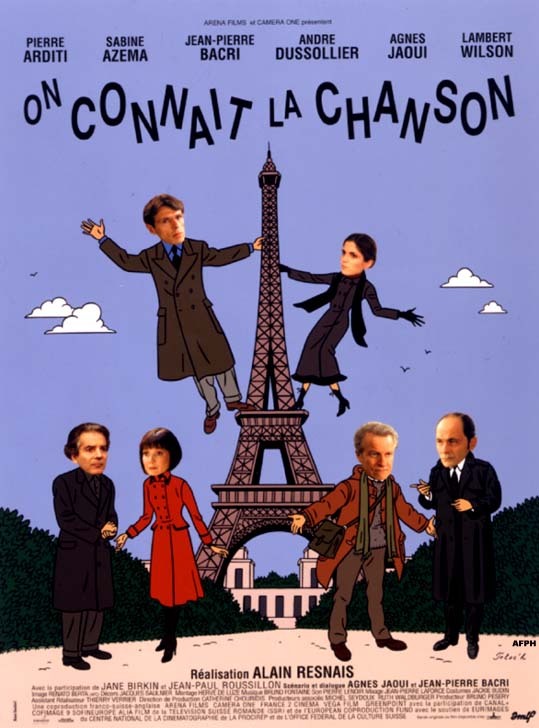 Certainly French "On connait la chanson" is a great French movie. Not often the culture and lifestyle of a country is shown so happily, modern and still entertainingly in a film. The plot is not "straight", it's rather a patchwork of single stories, that are connected with each other. The French chanson, the title says it, plays a central role. It is this kind of music, though sometimes pretty close to kitsch, that is so typical for France. Instead of expressing their feelings only in words, the protagonists sing lines from well-known chansons, all the way from Maurice Chevalier to Serge Gainsbourgh. Fortunately, there is no dubbed version of this film, the subtitles do very well. So if you want to know something about France and especially Paris today, go and watch it. Also people who normally don't like foreign films will have a lot of fun with it.